Black and white and color copies at competitve prices. Black and white copies are only 9¢ for letter, legal and tabloid size paper. Color copies are just 30¢ and that price also remains the same for letter, legal and tabloid paper. The staff at REPROS knows the importance of your projects and will help advise you on how best to present them. And because they work with students, faculty and staff every day, they understand and accommodate academic deadlines better than most! REPROS’ Ink Spot is a “print from anywhere” enhancement to the University’s pay-for-print service. Instead of having to print from a computer in the library or lab, students can send documents to print through any Internet-connected PC, tablet or smart phone. Sending documents from a PC or laptop is simple via Web upload; smart phones and tablets use the PrinterOn app, available for iOS, Android, and Blackberry. Uploaded documents reside in a print queue (for up to six hours) until released at any Ink Spot print station. There are currently 18 Ink Spot-enabled locations placed for convenience around campus. Enabled printers can be identified by an Ink Spot logo sticker. Ink Spot printing works exclusively with the 49er Account. UNC Charlotte has a pay-for-print system in most computer labs, in Atkins Library and at convenience printers located throughout campus. The 49er Account is what’s required to pay for print jobs in these areas. Auxiliary Services oversees the Reprographics Program that provides printing and copying services for the entire campus. The program is administered by Ricoh Professional Services. Copiers utilize the 49er ID Card system. 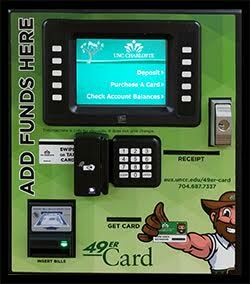 For students, the 49er Account or a 49er Cash Card is what's required to pay for copy/print jobs. 49er Cash Cards are also available from an automated Value Transfer Stations (VTSs) on campus (shown at right). Faculty and staff may use their departmental codes or copy cards to pay for copy/print jobs. Administrative copy cards are requisitioned from the Copier Department office in the Auxiliary Services Building. Faculty and staff can also print from their office computer to any pay-for-print device across campus. To do so please contact us. REPROS also maintains the computer lab printers and self-service convenience copiers placed around campus. Convenience copier locations. These devices utilize the 49er ID Card system. Personal copies are paid for by using the 49er Account or a 49er Cash Card available from an automated VTS machines on campus. Administrative copy cards are requisitioned from the Copier Department office in the Auxiliary Services Building.